One Approach To Head Start: To Help Kids, Help Their Parents : NPR Ed One Tulsa, Okla., nonprofit believes that improving poor kids' prospects also requires preparing their parents for well-paying jobs. The program's director says managing both is a tough nut to crack. Tiffany Contreras kisses her daughter Kyndall, 4, goodbye at Disney Elementary in Tulsa, Okla. As part of a pilot program that aims to educate both children and families, Contreras takes classes at Tulsa Community College for free. 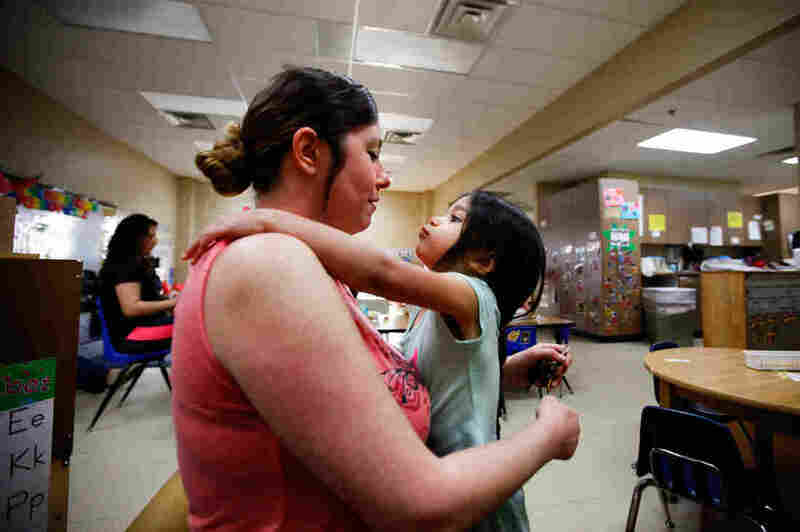 More On Preschool In Tulsa, Okla.
NPR's education team has taken an in-depth look at preschool in America. To hear Eric Westervelt's radio story on the Career Advance program, click the audio link below. And click 'What Exactly Is High Quality Preschool?' for more on Tulsa's pre-K program. President Obama has called repeatedly on Congress to help states pay for "high-quality preschool" for all. In fact, those two words — "high quality" — appear time and again in the president's prepared remarks. They are also a refrain among early childhood education advocates and researchers. But what do they mean? And what separates the best of the nation's preschool programs from the rest? NPR found one answer to those questions in Tulsa, Okla. The city is known as a national leader in early childhood education. There, preschool means teachers are unusually well-educated, well-trained and well-paid. Educators in Tulsa have worked to make classrooms safe and nurturing, but also challenging. Another key to Tulsa's strategy: It innovates. Case in point is the city's approach to Head Start, the controversial $8 billion federal preschool program that aims to prepare low-income children for kindergarten. Organizers at the nonprofit Community Action Project of Tulsa County run a particular take on Head Start called Career Advance, and the idea behind it is simple: To help kids, you often have to help their parents. Conservatives have long blasted Head Start as an ineffective, Great Society relic that fails to improve academic outcomes for children over time. But CAP Tulsa believes its approach to Head Start is potentially game changing. CAP Tulsa strategically links Head Start services for kids with intensive parental support, including education and training to help parents build careers in nursing or other related health care fields. 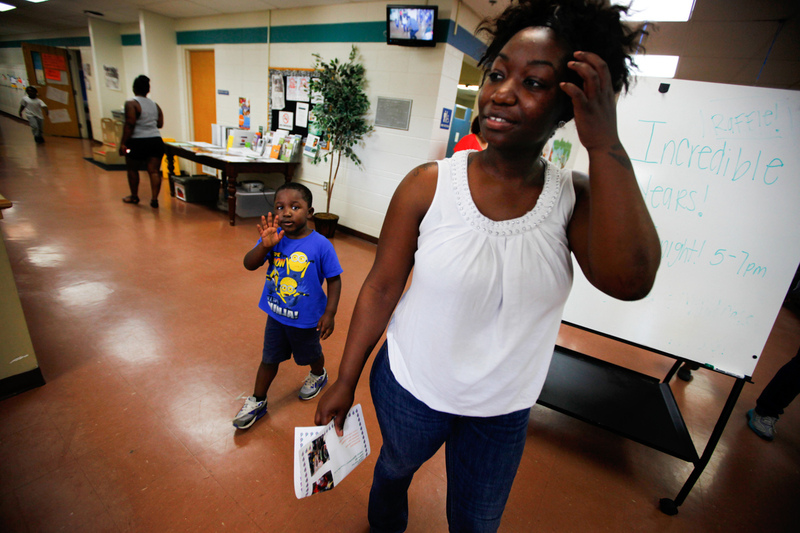 Shartara Wallace picks up her son James, 4, from preschool. Sometimes she takes her two children to community college with her if she needs to return to campus to study. And the program isn't just about learning to write a good resume. Career Advance offers some serious hand-holding for struggling parents, including life coaches and financial bonuses. 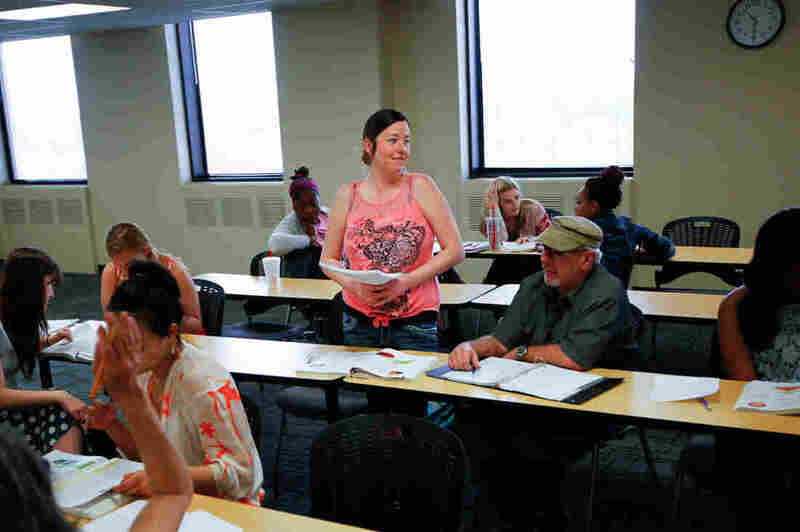 Two dozen students, all women, settle into metal chairs at long white tables in a classroom at Tulsa Community College's downtown campus. This is not an ordinary community college class. It's a required, monthly seminar for the enrollees in Career Advance, covering topics like resume building and finances. This week, it's workplace etiquette 101. A few women roll their eyes. Much of the class is common sense stuff: Show up on time, make eye contact, dress appropriately, give a firm handshake. "Has anybody ever had a wimpy, horrible handshake given to them?" the teacher asks as women chuckle. "It almost makes you make a facial expression when it happens, right?" Organizers say the classes help these parents improve their communication skills and self-esteem. The program is intentionally designed so the women re-enter the worlds of school and work as a group, to reinforce a "we're in this together" ethos. "You have to plan everything to make a good grade in class, to be a better parent. And you have to manage your stresses so you don't go crazy," says Consuela Houessou, who moved to Tulsa from the African nation of Benin about a decade ago. Houessou works weekends as a nurse's assistant. Through Career Advance, she hopes to become a registered nurse — a challenging but well-paying job in Tulsa. Houessou says her children are both proud and supportive. 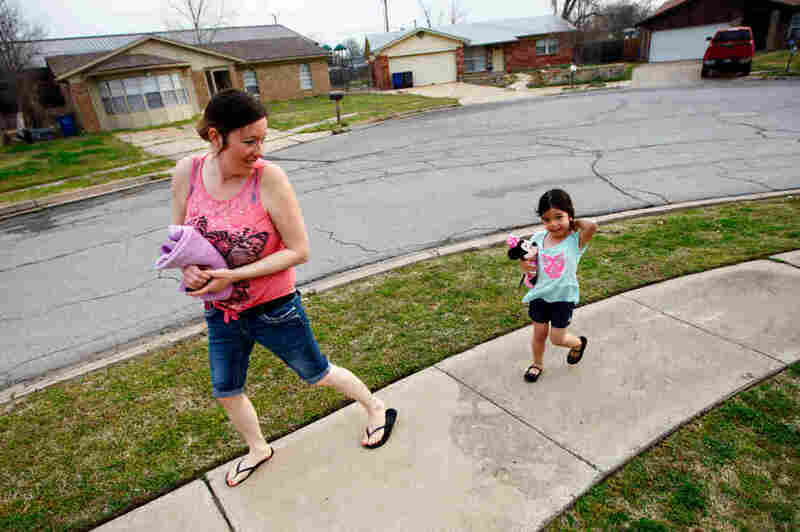 Tiffany Contreras walks her daughter Kyndall, 4, to preschool at Disney Elementary in Tulsa, Okla.
"They have a mom that goes back to school," she says. "Because I came here, I have to redo everything over. They want me to do well. We compare grades. 'I get A today, what did you get?' "
"The paradox of our early childhood work is that we are so focused on young children," says Steven Dow, CAP Tulsa's executive director. "And yet, many of the outcomes we want for young children are dependent on being able to also make progress with their parents and the adults. So this interplay is a tough nut to crack." But Dow and others here think they're starting to crack it. "We are seeing lives being changed," says Rebecca Floyd, a liaison between Tulsa Community College and Career Advance's nursing program. "They are studying at their kitchen table, and their kids are seeing them study, and they wanna study right along with Mom. "The confidence that you see — even their body language is different," she adds. "Their phrases are different. We are seeing lives being changed." It's close to 8:30 a.m. at a bustling Head Start center in East Tulsa, and Tiffany Contreras, 32, is late dropping off her youngest daughter, 4-year-old Kyndall. The kids who were here on time play with blocks, puzzles and books on the carpet while a teacher prepares a cereal breakfast. At 8:45, still no Tiffany Contreras. Her daily juggle is on: four kids ... a commute ... classes ... homework ... and meetings. Her husband, Jairo, the father of her two youngest children, works the night shift coating gas pipes and airplane parts at an industrial paint shop. Contreras finally arrives close to 9 a.m. Adding to her hectic mix this week: a dinner gone wrong that nearly torched her kitchen. "A pan of grease caught on fire. It ruined my stove and a couple of my cabinets. Thankfully no one was hurt. Story of my life. Always something," she says with a faint smile. After dropping Kyndall off at preschool, Tiffany Contreras heads straight to class at Tulsa Community College. "It's all of those things together they're trying to figure out how to finagle — and still be successful in school," Oehlke says. Contreras kisses Kyndall, a vivacious child with big cheeks and a bright smile, and her straight black hair tied in a loose ponytail. "No tears. Have a good day today," Contreras tells her daughter, then jumps into her car and heads toward Tulsa Community College. A class paper is due ... and there's a test. Contreras was born in Tulsa but moved away. Now, she's back home with four children and plans to become a registered nurse. It's hard. She's been down the college road before, but it never panned out. "I had tried to go back to school and just, life happened," she says. "Either having kids or having to work. And before, time management didn't work out so well for me." Tiffany Contreras gives a presentation in a nutrition class at Tulsa Community College. She's pursuing a nursing degree as part of the Career Advance program. This time, she insists, is different. She quit her job at Toys R Us and enrolled in Career Advance, where she's now trying to wrap up her RN prerequisite classes. "OK, so now, Tiffany, where's vitamin D gonna work?" Janice O'Meilia, a nutrition instructor asks. Tiffany sits attentively in the front row, wearing pink flip flops and sweatpants, pen and notebook ready. "At the bones?" she asks. It's the right answer. Career Advance covers Contreras' tuition and child care, and gives her bonus money for good grades, good attendance and more. Those grade bonuses are $200 a month in expense reimbursements or gas cards. The women can also apply for emergency gas cards if times are tough. Of all these support tools, the program's life coaches, like Megan Oehlke, may prove the special sauce. They're part mentor, uber-mom, counselor and motivator. "OK, so you had a house fire. Does that mean you can't be a nurse anymore? You didn't do well on this test; is that the end of your college career?" asks Contreras' coach, Oehlke. "Or do we practice some resiliency skills, see if you can retake the test? Sometimes it's just having that voice of reason that tells you: Pick yourself up, and move on." Coaches say it's vital to foster these parents' perseverance — but that it's not easily done. "What I think a low-income lifestyle teaches you is that you're vulnerable," Oehlke says. "Many people do have that kind of grit or that ability to pick up and move on. But so often when they've tried in the past, when that vulnerability gets the best of them, it doesn't matter how hard they've tried. They don't get ahead. So how do you tell 'em, 'Go try again'?" Plenty of programs across the country claim to take a "whole family" approach, marrying child care services with job training for parents. But too often that training is merely referrals, phone numbers and contact lists. Supporters believe Tulsa's program is different — more in-depth, more focused. Shartara Wallace helps her son James, 4, make a peanut butter and jelly sandwich at their home in Tulsa, Okla. Wallace is working toward a nursing degree through the Community Action Project's Career Advance Program. "The intent really was to make the parental part of this much more intentional, much more intense," says Christopher T. King, director of the Ray Marshall Center for the Study of Human Resources at the LBJ School of Public Affairs at the University of Texas at Austin. King is assessing Career Advance and is an adviser to the project. "What the people who support Head Start in Tulsa came to realize pretty quickly was what moves the kids' success socially, emotionally, educationally over time, and produces a lasting effect, is when their parents are also making progress," King says. "For example, so, if a mother increases her educational attainment while the kids are, say, 1 year old, 2 years old or 3 years old, that produces not only a positive impact on the kids' progress, but it's one that endures through third grade, let's say," he continues. "Same thing with income. If a parent's income goes up by $2,000 or $3,000 when the kids are young, it has an effect on the kids' progress. And it really lasts," King says. Shartara Wallace, 29, says she had long wanted to go back to school. Then she heard about Career Advance. "And they were gonna pay for it, and so I was like, let me jump on this," she says. Wallace has two young boys, 4 and 9 years old, from different partners. Her youngest, James, attends a Head Start program run by CAP Tulsa. Wallace tried to go back to school before — and failed. For her, the program's big draws were the monetary rewards for good grades and attendance, and the career coaches. "They've become almost like second mothers," she says. "Because they really stay on you, they push you. And then, at the same time, they are there to hold your hand. But just like a parent where it's like, 'OK, I need you to walk on your own and handle this, but I still got your back,' " she says. Wallace hopes she can stick with the program and become a registered nurse. Some days, that means juggling class and her boys. "I bring them with me if I need to come up to the school to study," she says, "just to let them know it's OK to go to school. "You need to get an education," she continues. "My oldest kinda gets inspired about it. He's only 9, and he already talks about college and things like that. He's in the third grade. They have this test coming up, and him seeing me studying, he wants to study." 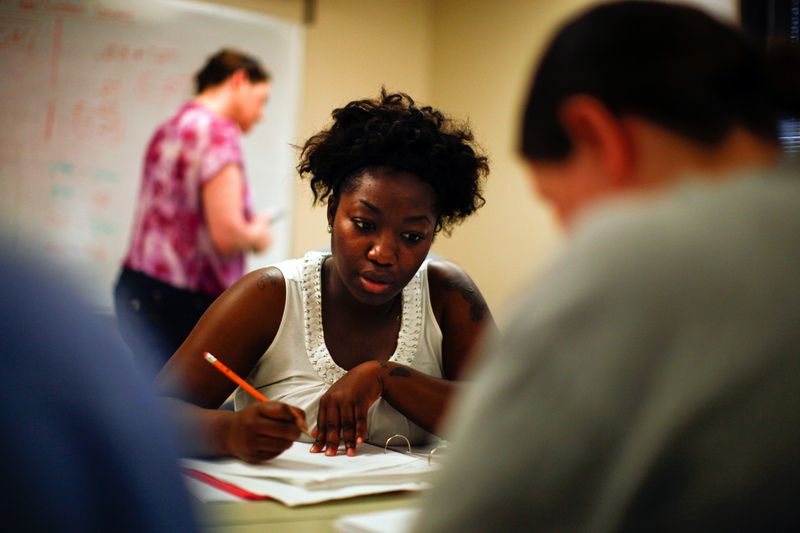 Head Start's conservative critics are adamant that the Great Society program is a failure. Rep. Paul Ryan, Republican chairman of the House Budget Committee, recently said, as part of a highly critical GOP take on the War on Poverty at 50, that Head Start should be replaced. His report suggests deep flaws in the design, management and coordination of the nation's many anti-poverty programs. On early childhood education, Ryan notes that 3- and 4-year-olds who were part of Head Start impact studies showed little or no improved cognitive, social-emotional and health outcomes over non-Head Start families. One impact study released in 2013 showed that Head Start benefits mostly vanish or "wash out" by the end of third grade. Shartara Wallace works out a problem in a basic math class at Tulsa Community College. She's tried going back to school before, but hopes the support of the Career Advance program will help her finish this time. 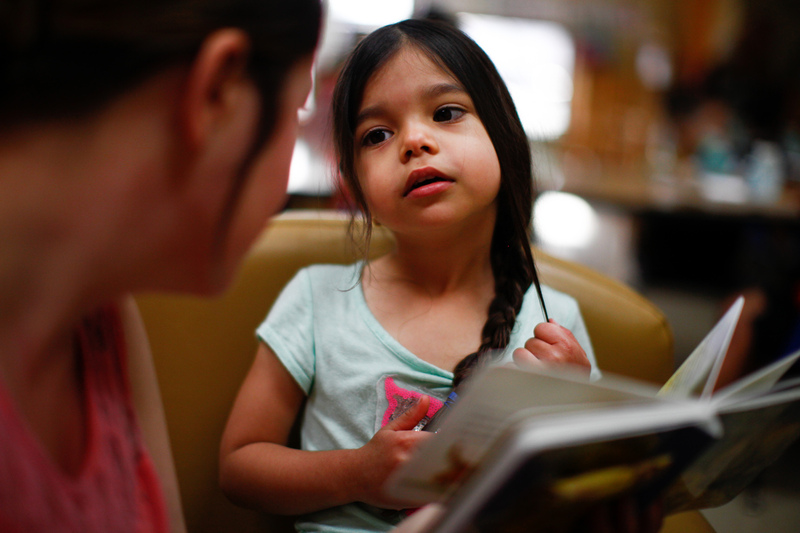 Conservatives argue that, while Head Start claims to focus on the whole family, programs too often fail to coordinate and to lift families out of poverty. Critics point to a Head Start study that showed no statistically significant effect on 9 of 10 measures reported by parents. And, as innovative as Career Advance is, it has plenty of weaknesses. Many parents who sign up don't last. About a quarter of the women drop out and never come back. Many more sign up for the RN program but stop short with lesser certificates in nursing or hospital support services. University of Texas professor Christopher King notes that was always part of the plan — that participants who need to stop or drop out could do so with at least a basic credential and the hope of a better job. "The fact that high shares of those dropping out do so with credentials and with jobs in health care is a good thing," he says. This kind of intensive support also comes with a considerable price tag: cash bonuses, coaches, seminars, emergency gas cards. It costs more than $7,000 per year to support each parent. And that's on top of the roughly $7,500 being spent per child for Head Start services. King is now studying the program's long-term impact, and it will be a few more years before results are in. But he's convinced that getting policymakers and agencies to think about the family — as a whole — will save taxpayers money in the long run. "If you actually double-down your monies on a family as a whole, those are families you can actually get out of poverty and not see coming back for public support," he says. "What we're trying to do is to bring the partners and stakeholders together and say, 'Let's think about parents and kids at the same time.' 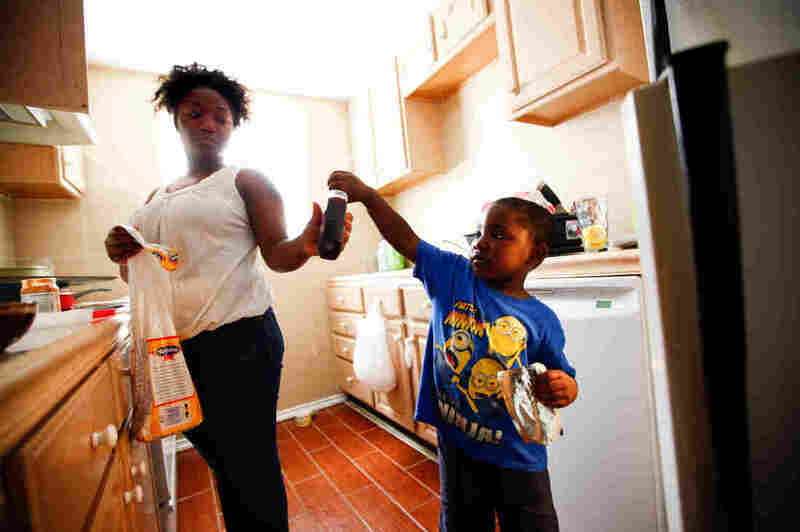 I think we can break that cycle of poverty for at least a number of families." The pilot project funding for Career Advance came from the foundation of billionaire oil and gas philanthropist George Kaiser, a longtime supporter of early childhood programs. Now the federal Department of Health and Human Services is funding it. King says these kinds of two-generation programs are expanding — to Boston, Los Angeles, San Antonio and elsewhere. "I think if you can basically show people the way and show them how to redeploy existing monies, build on [an] existing network, we actually could scale this thing up," he says. "I'm not sure we could help every family. We could certainly make it a lot more prevalent than it currently is." Back in her car, driving along Route 66, Kyndall's mom, Tiffany Contreras, says the RN program is daunting. Motivation and time management haunt her as equally as the science and math she hasn't tackled in years. And she's got a lot on her plate. She needs to raise her GPA, finish her prerequisites and find an RN program willing to take her on. "I've been busting my behind," she says. "My confidence is a little iffy right now. But my career coaches tend to try to boost that for me." Contreras heads home to her kitchen, with its slightly burned cabinet and damaged stove, to take care of her four kids — and study.